A hurricane is a large cyclonic storm with 74mph or greater winds that blow in a large spiral around a relatively calm center. The eye of the storm is usually 15-30 miles wide, and the hurricane may extend over 400 miles. The dangers of the storm include torrential rains, high winds and storm surges. High winds are a primary cause of hurricane-inflicted damage and loss of life. Another cause is the flooding resulting from coastal storm surges and the torrential rains which accompany the storm. flooding. Since 1900, thirty-nine tropical systems have impacted New England. Twenty-five were hurricanes, while fourteen were of tropical storms. Any tropical storm or hurricane is capable of bringing a combination of high winds, large storm surges and severe inland flooding along rivers and streams. Of the 24 hurricanes, 9 made landfall along the southern New England coast. Of those 9 hurricanes, 7 of them were either of category 2 or 3 intensity based on the Saffir-Simpson hurricane scale. Though the primary threat to New England is during August and September. The region has been affected as early as June, and as late as mid October. The worst hurricane to affect New England was the Great Hurricane of 1938, which struck on September 21st. The Great Hurricane of 1938 struck at high tide, which coincided with the highest astronomical tide of the year, pushing a storm surge of 12 to 15 feet across the south coast and up the many bays and inlets including Narragansett and Buzzards Bay. Winds of over 120 mph blew across the coastal regions. The Blue Hill observatory, in Milton MA, recorded a sustained 5-minute wind of 121 mph and a peak gust to 186 mph. Parts of interior Connecticut and Massachusetts bore the brunt of the high winds and experienced severe river flooding as rain from the hurricane combined with storms from earlier that week to produce a total rainfall of up to 17 inches. 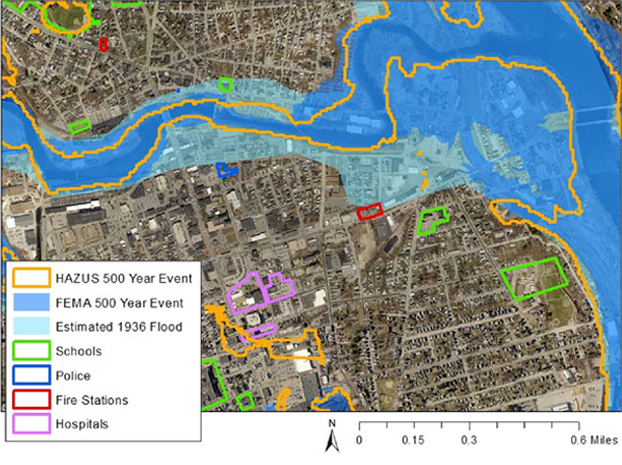 This resulted in some of the worst river flooding ever experienced in parts of Connecticut and Massachusetts. This powerful storm caused 564 deaths and over 1,700 injuries. Nearly 9,000 homes and businesses were destroyed with over 15,000 damaged. The boating community was equally devastated with 2,600 boats destroyed and 3,300 damaged. It is not uncommon for New England to be impacted more than once in a given season. The area has been impacted by two or more tropical storms or hurricanes in one season a total of 11 times. The most notable season was 1954, when hurricanes Carol, Edna, and Hazel impacted the region. What is the Risk of Hurricanes in New England? Coastal inundation due to the storm surge. Widespread inland small stream and river flooding due to torrential rains.. The strongest hurricanes, such as the great New England hurricane of 1938 and Hurricane Carol, have brought severe damage to coastal locations, while totally disrupting utility power for days across the interior from downed trees and high winds. Both the stronger hurricanes and several of the weaker tropical storms have caused inland river flooding in various parts of the New England. History clearly shows that everyone living in southern New England must take tropical storms and hurricanes seriously. Whether you live along the coast, by a river or stream, or far inland, a tropical storm or hurricane striking New England will have a great impact on you and your local area. Whenever a tropical storm or hurricane strikes, tune in to NOAA weather radio for the latest information, 24 hours a day. When Are Hurricanes Most Likely? Hurricane season begins on June 1 and continues through the end of November. August and September are peak months during hurricane season. People who live along the coast are most at risk due to storm surge. Inland areas can also be affected by high winds, floods, and tornadoes spawned by the hurricane. Hurricanes can develop when the sun’s rays heat tropical waters. This causes the air to grow warmer and rise. Water rises with it as vapor, and heat released from the water vapor causes the air to rise faster and faster. In about 12 hours, the heated air will begin to circle counterclockwise, forming stronger and stronger winds that whirl with increasing speed. A wind becomes a hurricane when it reaches speeds of more than 74 miles per hour. The moist, hot winds of a hurricane swirl upward around a calm column of low-pressure air known as the eye. Some hurricanes can develop more than one eye, but the main eye is the largest and measures an average of 15 miles across. Inside the eye there are no storm clouds, almost no wind, and calm conditions. The rising winds rotate in increasingly tight spirals around the eye, rising faster and faster. Cooler air is also sucked in, heated, and sent twisting up the eye. When the hot air rises high enough, it cools and forms water droplets that cluster together as clouds and drop rain. The rain is blown around by fierce winds. As a hurricane moves, it churns up the sea beneath the eye, drawing ocean water beneath the eye into a mound of water known as a storm surge, and creating huge ocean waves from its high-speed winds. The storm surge is carried along by the storm onto the shore. On the average, 10 tropical cyclones develop in the Atlantic each year. Of these, six may strengthen to hurricane magnitude, of which two are likely to strike the United States. Hurricane winds in the northern hemisphere circulate in a clockwise motion around the hurricane’s eye. Hurricane winds in the southern hemisphere circulate counterclockwise. Hurricane Camille (1969) and hurricane Hugo (1989) produced over 20 foot storm tides. In less than four weeks in 1992, two hurricanes, Andrew and Iniki, hit the United States causing more than 30 billion dollars in damage. A Hurricane Watch is declared when hurricane conditions are possible in the specified area of the Watch, usually within 36 hours. Stay tuned for additional advisories. A Hurricane Warning is declared when hurricane conditions are expected in the specified area of the warning, usually within 24 hours. Complete all storm preparations and evacuate if directed by local officials. Before the storm, bring in all outdoor furniture, decorations, garbage cans and anything else that is not tied down. If you have them, cover all of your home’s windows with pre-cut ply wood or hurricane shutters to protect your windows from high winds. Plan how you will leave and where you will go if you are advised to evacuate. If you do not have a car, plan alternate means of evacuating. If you have a car, fill the gas tank in case you have to evacuate. Drive only if absolutely necessary and avoid flooded roads and bridges, which may have had their supports washed-out. Get inside and seek shelter. Wind blown items can cause serious injury. Mitigation is the cornerstone of emergency management. It’s the ongoing effort to lessen the impact disasters have on people and property. Mitigation involves keeping homes away from floodplains, engineering bridges to withstand earthquakes, creating and enforcing effective building codes to protect property from hurricanes — and more. FEMA also suggests that communities further reduce their vulnerability to hurricanes through the adoption and enforcement of wind- and flood-resistant building codes. Sound land-use planning can also ensure that structures are not built in the highest hazard areas. Make a list of items to bring inside in the event of a storm. A list will help you remember anything that can be broken or picked up by strong winds. Hurricane winds, often in excess of 100 miles per hour, can turn unanchored items into missiles. Keep trees and shrubbery trimmed. Make trees more wind resistant by removing diseased or damaged limbs, then strategically remove branches so that wind can blow through. Hurricane winds frequently break weak limbs and hurl them at great speed, causing great damage when they hit property. Hurricanes also uproot tress, knocking them into your home. Debris collection services may not be operating just before a storm, so it is best to do this well in advance of approaching storms. Remove any debris or loose items in your yard. Hurricane winds can pick up anything unsecured, turning these items into high-speed missiles. Clear loose and clogged rain gutters and downspouts. Hurricanes often bring long periods of heavy rain. Providing clear drainage will help prevent flooding. Install permanent hurricane shutters. Hurricane shutters provide the best protection for your windows and doors. Taping windows could take critical time from more effective preparedness measures. All tape does is help prevent glass from broken windows from scattering all over inside. Tape does not prevent windows from breaking. If you do not have permanent hurricane shutters, install anchors for plywood (marine plywood is best) and pre drill holes in precut half-inch outdoor plywood boards so that you can cover the windows of your home quickly. Mark which board fits which window. Well ahead of time, buy any other items needed to board up windows and protect your home. When a hurricane threatens, supplies are quickly sold out at many stores. Stock may not be replenished until after the storm. Note: Tape does not prevent windows from breaking, so taping windows is not recommended. Most homes destroyed during recent hurricanes had no window protection. Hurricane-force winds entering a home through broken windows can blow out walls walls and lift roofs. Install protection (shutters or plywood) to the outside areas of sliding glass doors. Glass doors are as vulnerable as windows. Strengthen garage doors. Many houses are destroyed by hurricane winds that plow through garage doors, lift the roof, and destroy the remainder of the house. Elevate coastal homes. Raising houses to a certain height will make them more resistant to waves and storm surges. There may be many local codes affecting how and where homes can be elevated. Meet with your emergency manager or planning and zoning official for a description of the process to have your home elevated. There may also be community funds available for such measures. Talk to your insurance agent. Homeowners’ policies do not cover flooding from hurricanes. Ask about the National Flood Insurance Program (NFIP). Ask about your community’s hurricane preparedness plan. The local emergency management office or local chapter of the American Red Cross should be able to provide you with details of this plan, including information on the safest evacuation routes, nearby shelters, advice on when schools would be closed and what conditions are necessary for recommended evacuation of certain areas.